You need this recipe in your life and you need it now. Vegan or not even close, you can believe these cauliflower bites are the bombbbb.com. Not only are they healthy, but they’re gluten free and cruelty free. They’re also most definitely bland free and bore free, phew. Whether you like cauliflower or think you don’t like cauliflower (key word: think), this recipe will tingle your tongue and water your taste buds. Great for Sunday night football, a Thanksgiving side dish, or just as afternoon nibbles, these cauliflower bites don’t make eating healthy feel lame. At. All. I know there are some cauliflower haters out there, and believe me, I used to be one of them. But, I think it’s time you give them a try ‘cause they seriously don’t even taste like cauliflower. If you’re as obsessed with Frank’s Red Hot as much as I am, or you’re a hot sauce fan in general, these cauliflower bites slathered in Frank’s magic spice elixir will absolutely keep you wanting more. Even my boyfriend’s family is obsessed with them too and not ONE of them is vegan. Since I’ve introduced this recipe to them, they’ve made it three times themselves. Maybe if I keep making these bites for them, they’ll keep me around ;). Well, shall we get cooking? Chop cauliflower florets into bit sized pieces. Place aside. Add all dry ingredients to a mixing bowl and stir: flour, paprika, cumin, garlic powder, salt, pepper. Add water to the flour mix and stir until it becomes a batter. Toss chopped cauliflower florets into batter and stir until all pieces are covered by the batter. 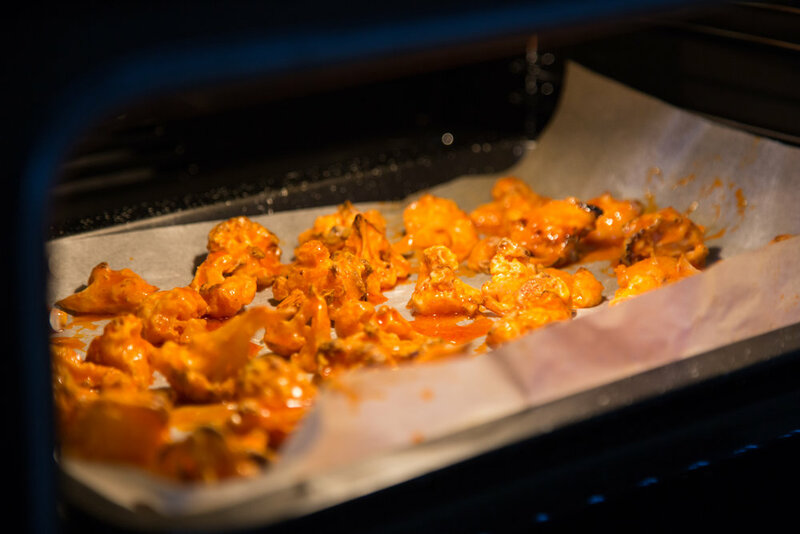 Evenly spread the cauliflower bits onto a baking tray lined with baking paper. You may need to use two trays or bake them in two batches. Bake for 30 minutes. If you are baking two trays at once, be sure to swap trays around halfway through for even cooking. While the cauliflower is baking, mix the Frank’s Red Hot with the melted butter in a separate bowl. 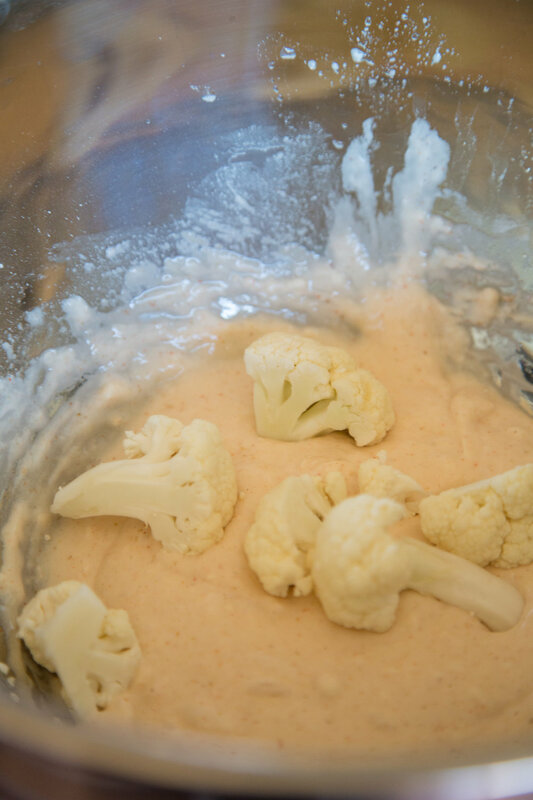 Remove cauliflower from oven after 30 minutes and toss in the Frank’s hot sauce mixture. Put coated cauliflower back on baking tray and bake for another 15-20 minutes depending on desired crispiness. If you try out this recipe, let me know in the comments below how it goes down!